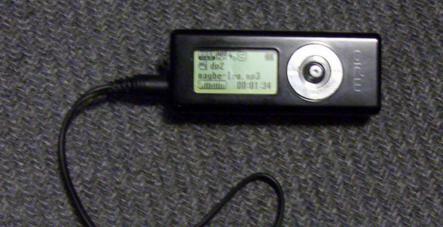 This is a cheap (CAD $90-ish) 256Mb MP3 player. It works! I was thinking of getting one of these to play with, but I don't listen to music much anymore except in the car. Then I thought, "hey, some hard-driving rock for skiing to might be fun, and it won't skip or bang into me etc. like the old Walkmans or CD-players". Haven't tried it yet...skiing, that is. The box says it doesn't need drivers, and it doesn't. It just shows up as a memory stick on USB. Doesn't like double-dot filenames that I tend to use like living.dead.mp3, but is happy with spaces.